Afrika week 2017 is coming! Monday February 13 till Friday February 17, Randwijck will be totally covered in African style, because this week is MUSTANGH’s annual Afrika week. 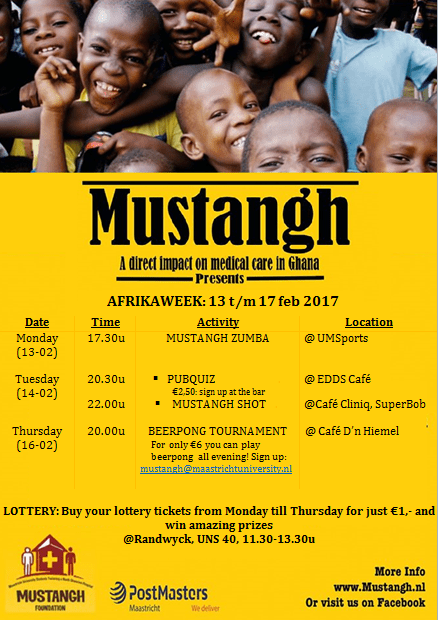 From pubquiz to lotery and from zumba to beerpong: All nice activities, of course with a Ghanaian twist, where you can support charity. Check our posters, keep an eye on our Facebookpage for the complete program and join! All together, we can make this week successful! Next Next post: Africa week 2017 a huge success!